Introduction: As many of the people reading this are probably not local to the Sitka area, it is probably worth a brief explanation of who they are. Marge Ward and Marlys Tedin (often referred to as Marge and Tedin) are two long time Sitka residents who became interested in birding when they were middle-aged. They had the chance to take an ornithology class in 1980 and the instructor recommended a system for recording bird sightings that they maintained from that time until the present. It’s a fairly simple system that involves a week’s worth of days forming columns on a 5×8 card and a row for each species. A simple check is placed in the species row under the day’s column if that species is observed. A one or two word statement about the weather for each day was included as well. Sometimes they embellished the simple records brief notes next to the check or perhaps on the back of a card. What has really made this data interesting is the diligence with which they have been recording it over the last 26 years. It is my understanding that in 2000, with report from the National Park Service, Rebecca Joyce began the project of entering the data from their cards into a spreadsheet or database to make them more accessible. I am told that she worked on this for 3 months and was able to get the records between 1981 and 1999 in electronic form. I recently was given a copy of the rather large spreadsheet that held this information. I converted the data to a form I could work with a little more easily and have started trying to summarize it in ways that give a sense for what’s in there. Caveats: Before going much further, I do want to emphasize what this data is and what it is not. It’s primarily a record of the observations made by two birders who started the time period as relative beginners with full-time jobs. As the years went on, they gained experience/knowledge and then reached retirement age (and so had more time to get out consistently). These practical realities are both reflected to a certain extent in the data. They birded extensively on the Sitka road system and its beaches, but only occasionally beyond that, so, while these records should be a good indication of what (and when) birds might be seen along the Sitka road system, there are several species of birds that are more common in the general area than is reflected in this data. Seabirds and grouse/ptarmigan are the main examples of this. Marge and Tedin were also daylight birders, so the owls do not show up well in their records. One last thing to note is that they took vacations and there is about 3 months of data missing (early 1983). This shows up best in the most common species (where you would not expect to see any holes). In any case, I think the data is fairly complete over the time frame being considered. 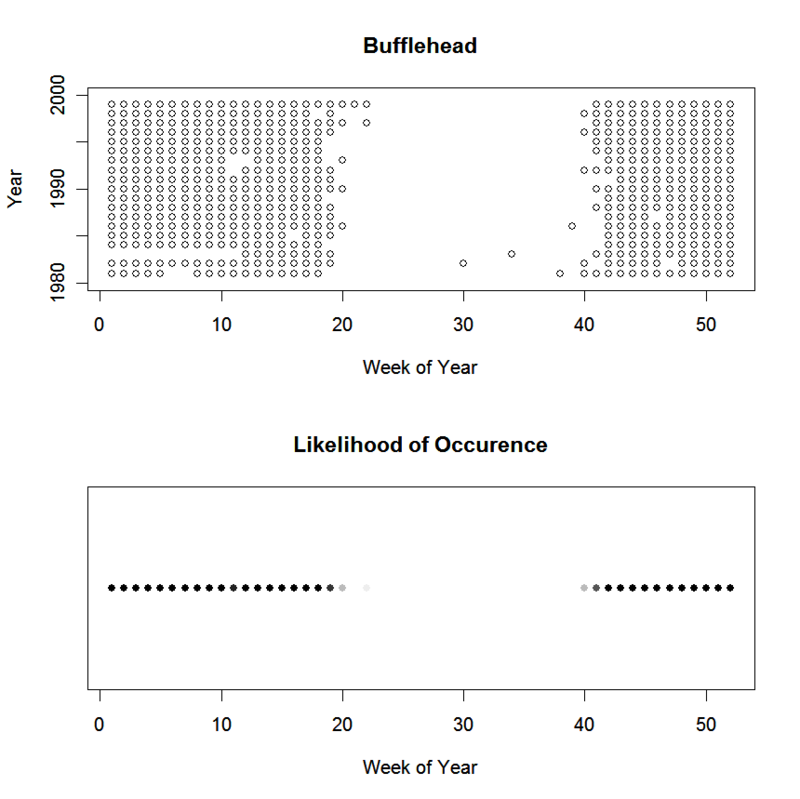 Beyond that, the figures I have generated are based on data I have not verified to the extent I would like to. I plan to do a more or less random check of some of the records against the original cards, to see if they seem to be consistent. I’ll also do a more thorough checking on records of unusual species. In some cases, after the initial record was written down, more experience and conversations with other birders may have changed their thinking on the observations. For this reason, I have only included the more common species in information I present here. For each species, there are two frames per figure. The upper figure is a weekly summary of sightings. The horizontal axis is weeks of the year (from 1 to 52, the partial 53rd week was just combined into week 52). The vertical axis is the year (with data from 1981 to 1999 included). Each circle represents at least one record of the species seen in the year/week indicated by the location in the figure. The lower frame is essentially a summary of the information in the upper frame. The shade of the circle represents how many years (between 1981 and 1999) the species was observed in a given week. In a sense it can be used to get an idea of how common a species is during the time of year. However, it is not a measure of abundance, only presence/absence during a given time of year. For the birds that are here all the time, presence/absence data is not so interesting, so I have chosen to display here species that all show striking seasonal patterns. To me it is remarkable how consistently from year to year the arrival and departure of Buffleheads is. 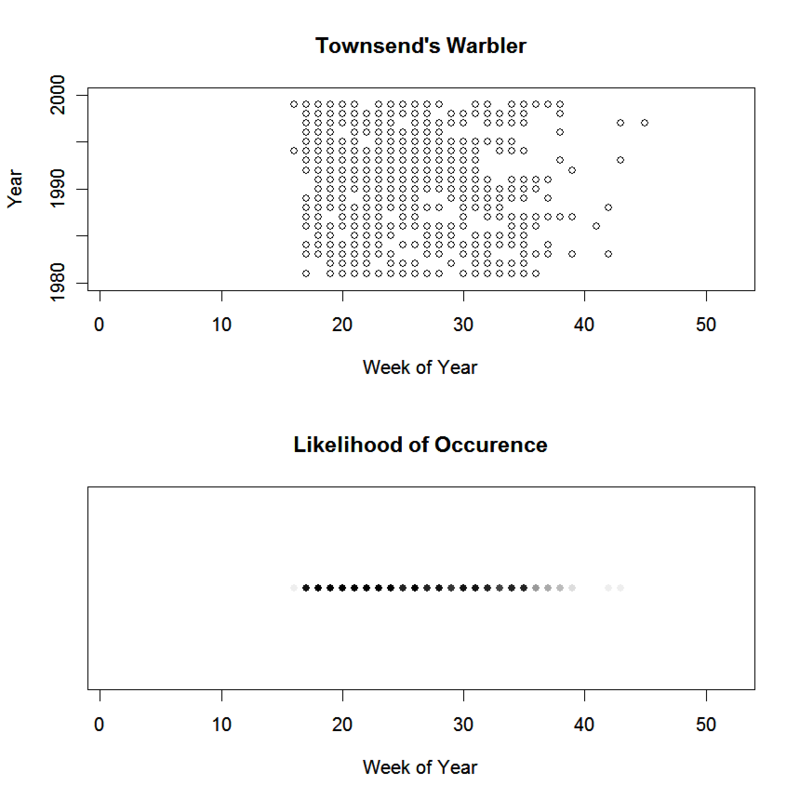 It’s interesting that Townsend’s Warblers are exceptionally consistent in their arrival time, but much less so on departure. The Western Sandpiper is pretty consistently seen during spring migration, but fairly irregular in the fall. 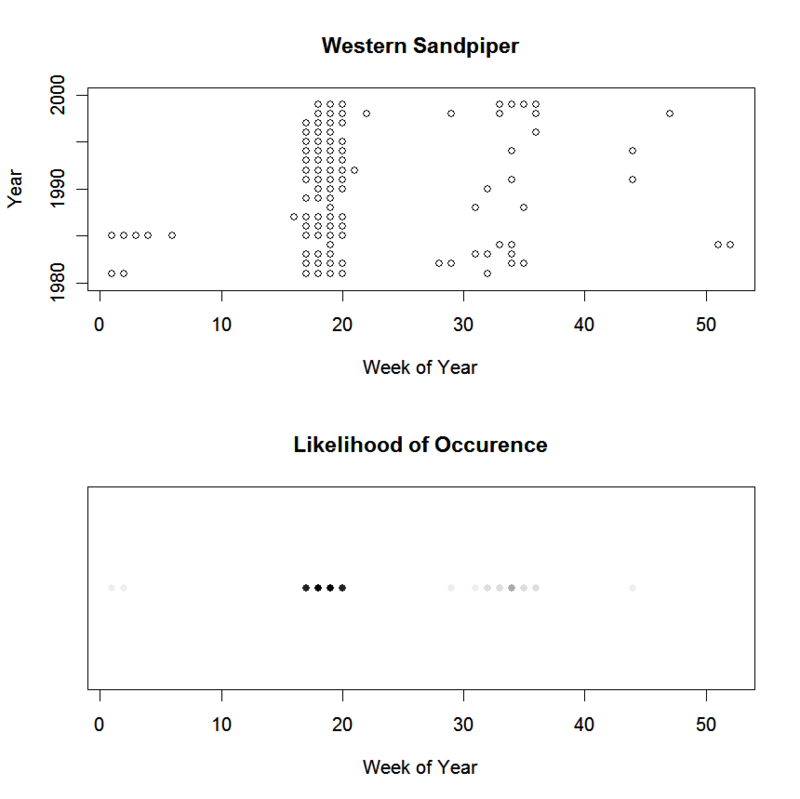 Also note that it appears that at least one Western Sandpiper spent the winter in this area on a couple of occasions. I have also made available figures summarizing the data for 100+ of the more commonly observed birds. The Future: As I mentioned above, I intend to check the data and verify some of the records. It’s my intention to move this data into a database (currently it’s in a plaintext .csv file) in the next month or so. At that point, my brother has agreed to help me by creating some web-forms to enter new data into the database. With the help of some others, I would like to get the most recent 6 years of data included. It is my intention to make the complete dataset available to others, though I am not sure how best to do that at this point. Once Marge and Tedin’s records have been entered, I am hoping I can put together a simple enough data-entry form that several people might be willing to continue building on the data Marge and Tedin have collected. In particular I would really like to see more information about the birds that occur off the Sitka road system, both on the land and out in the sound. It’s great to see records such as Marge and Tedin’s card system being put into a format that makes the information available to more people. Also, it would be excellent if others can build upon the information they’ve already amassed during their years of birding. Once I get the rest of the data put into the computer and get it edited and do some verification, I’m planning to submit all the records to eBird. I found out that (mercifully) they accept bulk uploads, so that should make it pretty simple. I definitely want to continue on and build upon the information they have collected. I hope to do that myself, and encourage others to as well.